How do I create and submit a report? How can I manually create a report? Expenses need to be on a report in order to submit. Once the expense has been created, it can be added to a report and submitted for approval, or closed if no approval is required. Ideally, you will use Scheduled Submit to do this for you! 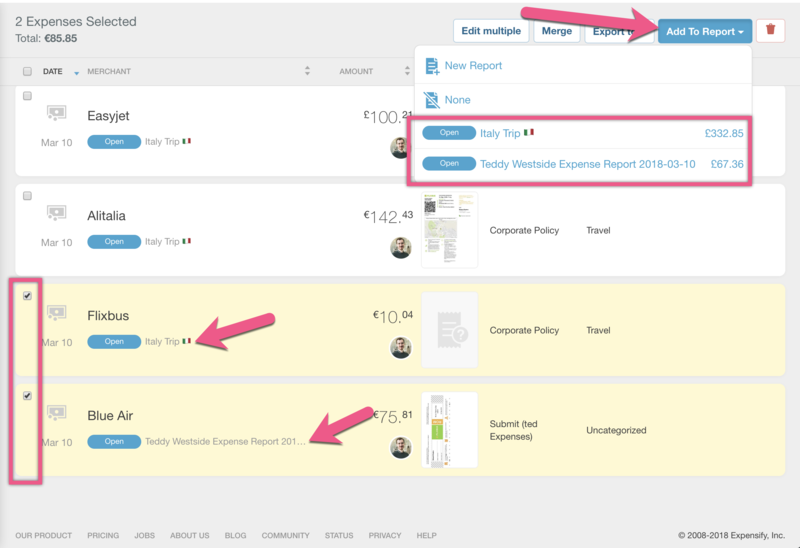 If Scheduled Submit is enabled, Concierge creates a report on your behalf when new expenses are created in your account, then submits your report based on the timeframe defined by either you or your Group policy's administrator. For more information, check out our article on Scheduled Submit. Tap the menu icon (top-left corner), tap Reports, and then tap the '+' icon. 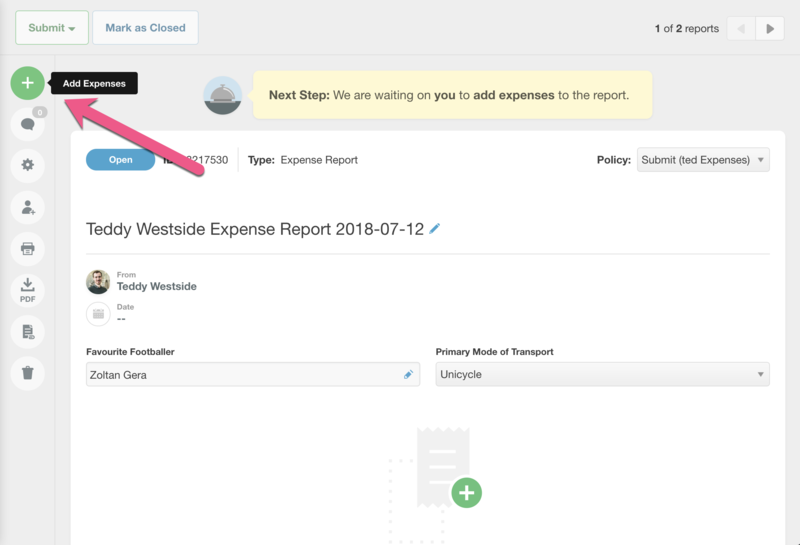 When you are finished adding and editing expenses, you should see Submit at the top of the screen. 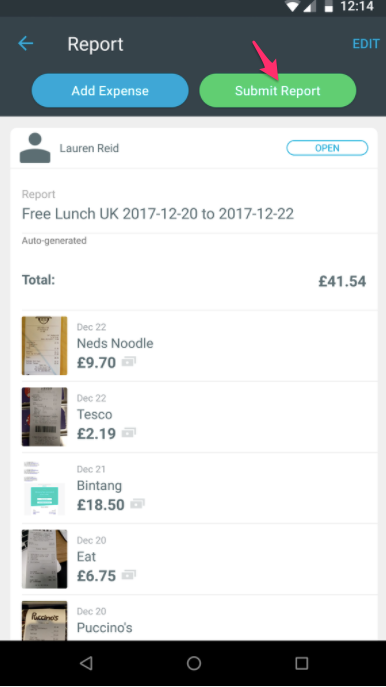 Tap this, confirm who you are sending the report to, then click Submit! Just that easy. Get started on a new report by clicking the “New Report” button on the Reports page. When you are ready to submit the report, make sure to check out any violations or notes that might hold up the report. Guided Review, (explained further below) will help you through this! When you're all set, click "submit", verify the approver, and then "submit" again. You're done! Can't tell what needs fixing on a report before you submit it? Never fear, Guided Review is here! 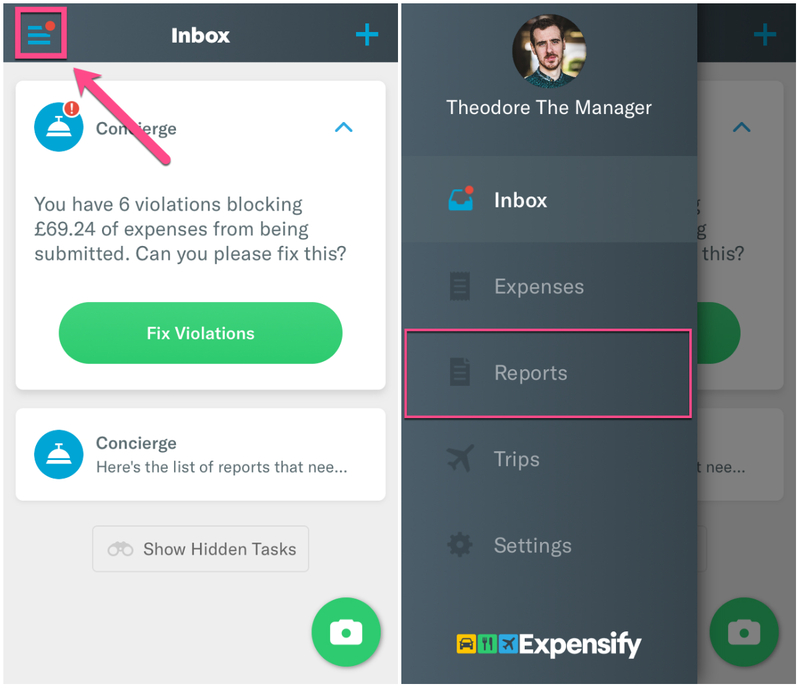 This ever so helpful feature will walk you through all items that need to be addressed in order for your report to submit with no issues. 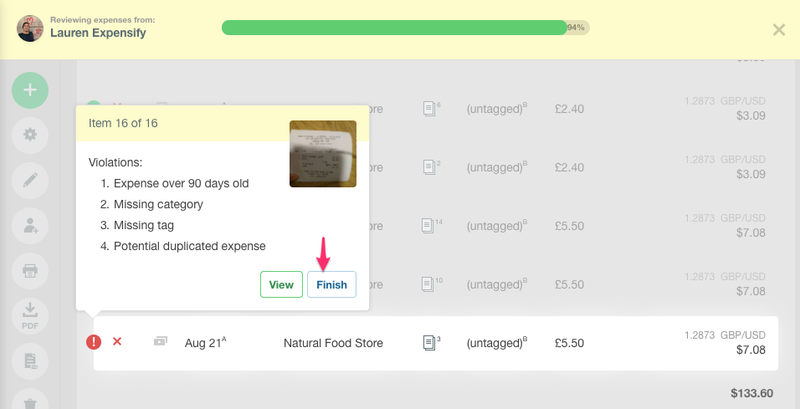 Step Three: Click the Finish button if you are done reviewing, or view the last item to finish the review process. You now have one perfect report ready for submission! On mobile, you will click Submit at the top right corner of the screen. When you click “submit…” the email field may already be pre-populated. In this case, the billing owner has specified that you should submit to this person. You can edit this email to submit to someone else for special circumstances, or include additional people in the cc field so that they are copied on the report. 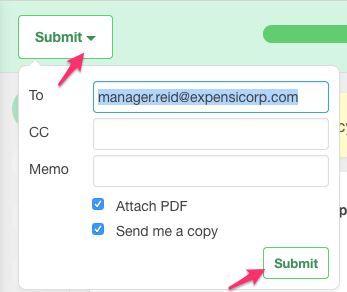 You can also include a Memo with any notes or extra comments for your approving manager. When your report is submitted, we’ll send an email to your approver letting them know that your report requires their attention. Sometimes your report will have violations and you still need to submit it. It’s ok - you can! 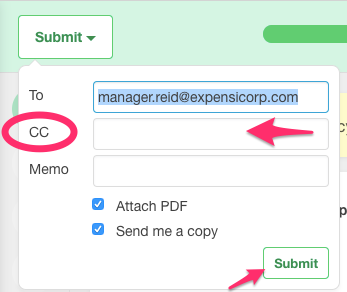 Just let your manager know in the “Memo” field why you are submitting the report this way. Violations that are commonly bypassed are receipt requirements for mileage expenses, or expenses that go over a certain amount. If you have any questions concerning violations, talk to your approver about changing the policy to accommodate these exceptions, or learn more about violations. 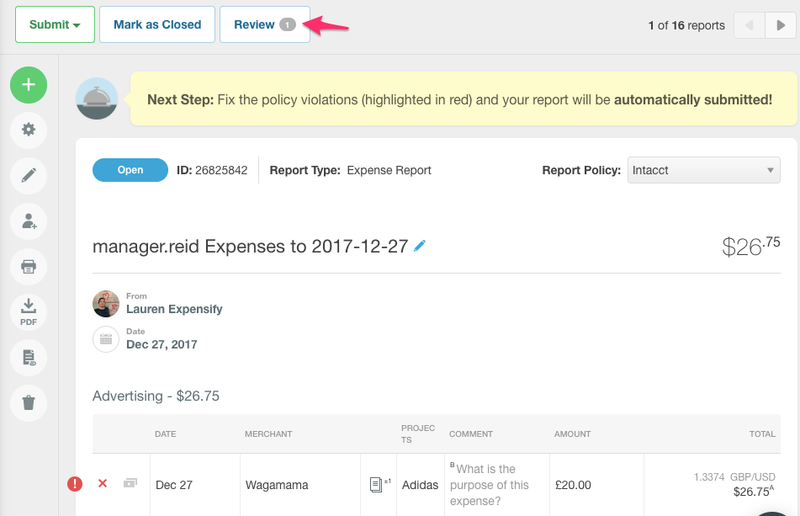 If you create an expense report that you don’t need approved by anyone, (perhaps you just clicked Track when you signed in) you can either Submit the report to yourself (if you want a copy of the report emailed to you) or you can "Mark As Closed." The report will then be in "Closed" status. If you need to modify the report after it has been closed, open the report and click "Reopen." It will return to an "Open" state and allow any necessary corrections. Reports can be deleted only if they are in an “Open” state, and only by the person who created the report. To delete a report, just click the “delete” button in the Report. The expenses in the report will not be deleted. They will be returned to the "unreported expenses" list. If you are an admin and don't wish to view certain reports (since you aren't able to delete or archive them), the best option is to clean up that list is to use the filters on the top of your Reports screen. 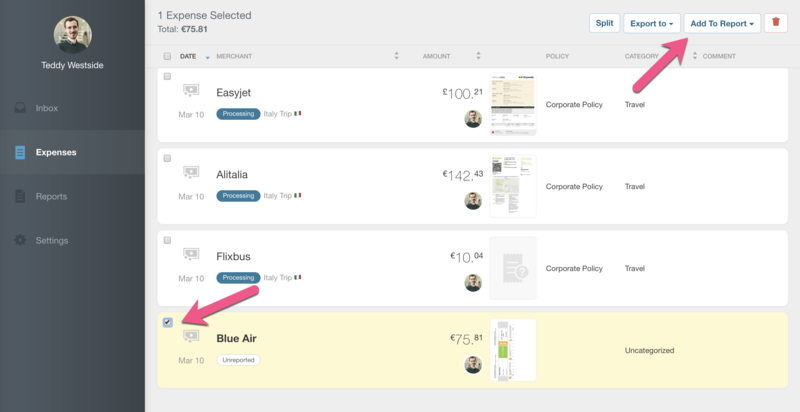 As a policy admin, you can view, edit and submit your employees' Open reports. 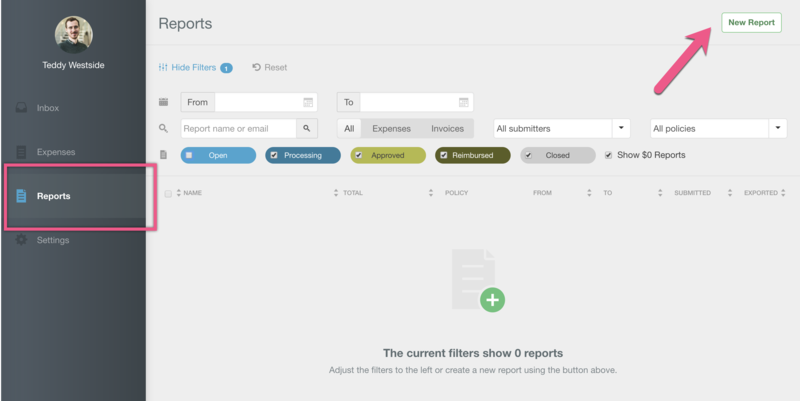 Click on the Reports tab then select the All Submitters and Open filters and you will see all employee reports on your policies that have not been submitted. Click on a report to view its contents. 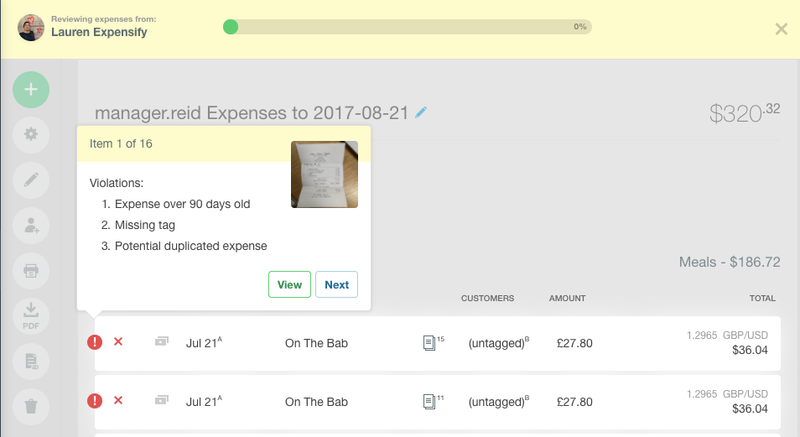 From here click an expense to view, add or modify details such as Categories, Tags and Description. You can also attach a receipt if one is missing. 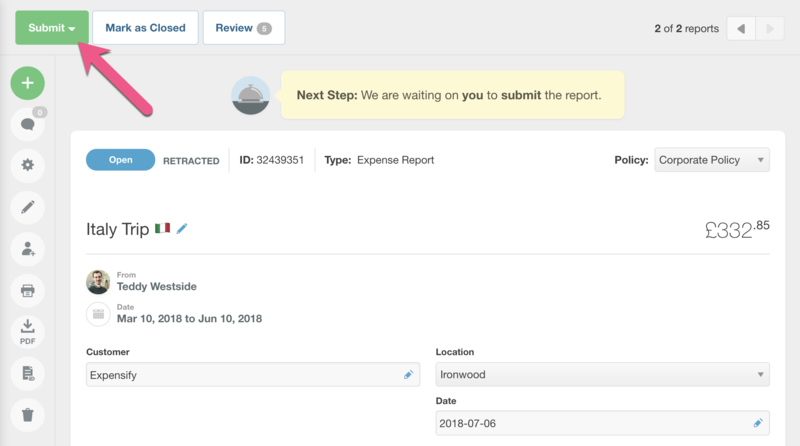 Any changes made by the admin are tracked under Report History and Comments and an email will be sent to the employee if you change the reimbursable status of an expense (e.g. from Reimbursable to Non Reimbursable). If an employee can't do it themselves, as a policy admin you can submit an expense report on their behalf to commence the approval process. Just hit the Submit button at the top of the report.